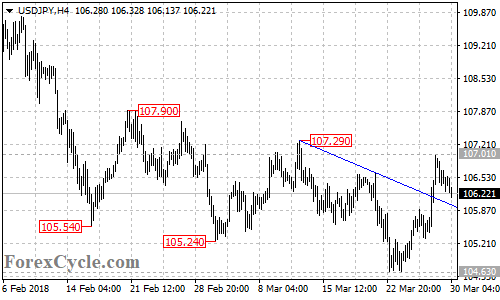 USDJPY remains in the uptrend from 104.63, the fall from 107.01 could be treated as consolidation for the uptrend. Support is at 105.75, as long as this level holds, the uptrend could be expected to resume and a breakout of 107.01 resistance could trigger another rise towards 108.00. On the downside, a breakdown below 105.75 support could bring price back towards 104.63. Below this level would aim 102.00 area.